All our Friday morning services tomorrow are cancelled. We will update from 11am on foot of weather updates & road conditions. Apologies any inconvenience caused. Due to the adverse weather the 07:45 service will NOT operate from Loughrea to Galway tomorrow (Thursday) or Friday of this week. All other services will continue to operate as normal unless any detioration in weather conditions. 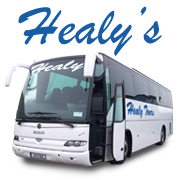 Check here or our healybus facebook for more updates. No Galway - Mayo 5pm Thursday service tomorrow March 1st due to the daverse weather. Friday services will operate as normal. stay safe..